Yamanashi Prefecture is the part of Japan once known as Kai Prefecture. That’s as in, The Tiger of Kai, Takeda Shingen, who I covered in a “Profiles of Bushido” post a couple of weeks ago. Put another way, this is the prefecture due north of Mt. Fuji. As a result, there is less rain in this prefecture than along the coast. 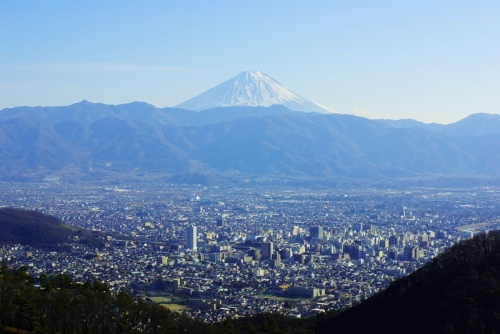 You can find details about everything Yamanashi offers, in English, on this page. Click on a component to see the vast offerings. In just the Division of School Education, specialized services in Japanese and English language education, social studies, mathematics, science, music, art, health, technology, and home economics, are offered. That’s a lot. In 2002, the University of Yamanashi was merged with a major medical university. Thus, the current University of Yamanashi also includes a vast School of Medicine. In addition, Yamanashi’s Faculty of Engineering doesn’t just talk the talk of improving society through science: it walks the walk, featuring a “Department of Ecosocial System Engineering” and aiding Japan in its push to be a world leader in environmental technology. More juicy info here. Yamanashi Prefecture became part of the Shogunate’s core territory. Over the centuries preceding the Meiji Restoration, it received lavish infrastructure spending. Today, it remains a major segment of Honshu (lit. : “main island,” the main island of Japan) in the heart of the country. With Mt. Fuji to the south, and picturesque lakes from which to gaze at it, Yamanashi is also a quality stop for tourists. Besides being a Mecca for Takeda Shingen fans (which is a good thing, by the way), the city is full of museums, cultural centers, the Yumura Onsen (onsen = hot spring), and precious gem museums from Kofu’s jewelry industry. I must admit to having a brief encounter with this industry. Once, I translated something related to an exhibition of Kofu jewelry. At the time, I didn’t even know anything about Kofu, but apparently its jewelry industry was far more famed within Japan than it has been in the modern era with stiff international competition. Government support (public-private partnerships and so forth) has been provided with the aim of kick-starting the industry into greater global recognition. Good luck to Kofu’s artisans! A full two-thirds of the city’s is actually covered by a mix of mountains and forests. Certainly, this is taking the scenic route. Yamanashi offers a lot of meat for the potential exchange student. In addition, the natural beauty is a definite plus. Considering how utterly packed Tokyo feels, a city of “only” 200k people certainly can’t feel that crowded, either. Definitely worth a look, especially for serial do-gooders who want to be part of improving the world through education, medicine, and technology. This entry was posted in Japan, Overseas Study, Tourism, Universities and tagged Japan, overseas studies, universities, Yamanashi, 山梨大学, 甲府市. Bookmark the permalink. This is a good post about The University! Learn more about this tradition here.